This book begins with a question and seeks to develop an answer. The question is simple: What role did the early mythic figure known as Cthulhu play in the development of world mythologies? The answer, however, is far from simple. To answer this question, we must travel across time and space, from the earliest human societies to modern times, from the frozen tundra of Alaska to the azure waters of Greece. We must examine evidence from oral traditions, written records, ancient art, and the findings of archaeology. Further, we must employ all the tools of scholarship to paint a picture of the past, to explore and explain a belief system that is quite alien from the way most modern people think about and conceive their world. And if that were not enough, we must also do so within the constraints imposed upon us by our fragmentary and somewhat contradictory knowledge of the Paleolithic-Neolithic entity known today as Cthulhu. The authors of the Hymns have thus discarded, or at least left in the shade, a great number of legends which existed previously […] But when we consider how crude often the language of the Hymns is, we feel justified in affirming that this scruple [i.e. propriety] was not the only one which induced the Vedic minstrels to pass hurriedly over these myths, and that in this matter we must also take into account their aversion to speak of the gods in too definite terms. To tease, therefore, the truth of the Old Ones from such sources will occupy the majority of our time. And yet it will also provide us with fascinating insights into the way the Paleolithic worship of Cthulhu fluoresced into an astonishing array of myths and legends, some still familiar to us today. In order to understand this process, we must first speak a bit about mythology. The modern world too often considers mythology a relic of the past, the fever-dreams of superstitious semi-barbarians who made up false stories to explain away the challenges of a world they were incapable of understanding. By contrast, too many in the modern world take the opposite tack, seeing in ancient tales of a gods and monsters a spurious wisdom descended from on high, a more perfect philosophy whose lessons should supersede contemporary manners and mores. In either case, modern people are too quick to project current fads and beliefs into the past and, in so doing, recreate ancient mythology in their own images. Instead, it is incumbent upon us as modern, educated readers of myth to explore mythology as closely as we can to the way the ancients themselves understood it. This means casting aside our modern biases and prejudices and taking the ancient world on its own terms, its greatness and its barbarity, its glories and its cruelty. It also means acknowledging, at long last, the hidden stream buried beneath the surface of so much of what has come down to us from antiquity in expurgated form. It means recognizing the role of the prehistoric myth cycle known as the Cthulhu Mythos in scholarly circles and using this knowledge as a baseline for analyzing and understanding the construction of world mythologies and their function in society. The word “myth” derives from the Greek mythos or muthos, itself derived from the word mu, which refers to the sound emitted from the mouth. A myth, therefore, is a story, one told from oral sources—but, significantly, as David Adams Leeming noted, it is also cognate with the Word of God, for to the believer the myth is the literal truth, the truth told from divine lips to human ears. Its origins, if the Cthulhu cult lore can be believed, are truths communicated from the minds of the gods directly into the human brain: “their dead bodies had told their secrets in dreams to the first men, who formed a cult which had never died.” (It was, incidentally, confusion over mu as a technical term for communication with the Old Ones that led that old fraud “Col.” James Churchward to mix together the word mu and elements of the R’lyeh myth to create his fictitious sunken island continent, drawing on Augustus LePlongeon’s fictional Queen Moo of the Maya in selecting the continent’s name.) Such stories, passed on from generation to generation, accumulated the weight of revealed truth, at least as long as the faith held firm. It was only with the coming first of Christianity and then of secularism that these ancient truths became little more than fanciful stories. Many attempts have been made over the centuries to understand mythology, beginning with the ancient Greeks. Under Euhemerus and his ilk, mythology was imagined as a series of true stories corrupted beyond recognition by the introduction of the supernatural into secular, human stories. Modern writers of the last century or so, including Sir James Frazer and E. B. Tylor, saw myth as the elaboration of simple, core ideas. In Frazer’s view, expounded in his twelve-volume The Golden Bough (1890-1915) this core idea was the “sacred kingship” represented by a god who dies and is born again. Frazer identified this god with vegetation, but as has become obvious in recent years, the gods who die and rise again are modeled quite closely on the prophecy of the return of the dead-but-dreaming Cthulhu from his undersea tomb. Later scholars, like Emile Durkheim, sought to locate the origins of myth in the structure and function of human societies; but such claims directly contradict the cult lore that suggests mythology’s stories originated long before the development of the complex societies that employed them. By contrast, Leo Frobenius argued for the widespread diffusion of myths from a common source, and it is here that the theoretical underpinnings of the Cthulhu Mythos emerge. This is not a book about the theory of mythology, nor could it be, since such a subject would require a volume of its own. For our purposes, we will take a myth to refer to a traditional story about the supernatural. This will include the stories of gods and monsters but will not, generally, include stories about historical figures except where they have been inserted into stories about gods and monsters. 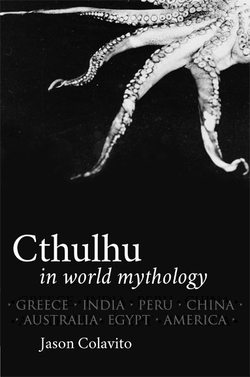 This book will be composed of several sections, each covering a different area of world mythology, following an initial chapter laying out the Cthulhu Mythos and its essential points. Thus, the first chapter will explore Cthulhu himself and what we know of him. Following this, we will examine the Paleolithic and Neolithic periods, with the earliest evidence for Cthulhu worship. Subsequent chapters will explore: Near Eastern and Egyptian mythologies, Asian mythologies, Australian and Pacific mythologies, the mythologies of the Americas, northern European mythologies, Greek mythology, and finally medieval and modern mythological survivals. Of course, this study cannot be considered comprehensive. First, the choice of myths to examine from each culture is necessarily selective, though I have tried to be representative of myth types in each culture. It is simply impossible, without writing an encyclopedia, to catalog every instance of our subject in every myth everywhere. Second, I have limited this study to Cthulhu himself because he is the best-documented of Mythos figures, and because it would require many volumes to do justice to each member of the prehistoric pantheon of Old Ones. Perhaps subsequent volumes can treat other members of the pantheon. With those caveats in mind, and our global itinerary set, let us embark on the grand quest in search of Cthulhu in world mythology. "Introduction" is excerpted from Cthulhu in World Mythology by Jason Colavito (Atomic Overmind, 2012). This work is copyright © 2012 Jason Colavito. All rights reserved. Reproduction is prohibited without the express written permission of the author and Atomic Overmind.